Twenty-six-year-old Whitney Carlos and her aunt Martha Fox can’t stop laughing as they untangle sticks, moss and a few salmon from Carlos’ set net in Togiak Bay. After fishing for days in the rain and wind the pair are basking in the sun’s rays. They can’t get over it. “It’s a beautiful day. We hadn’t had sunshine ––” Fox said. Martha’s brother Ernest Wassillie helped haul the net by hand over the shallow, 19-foot skiff. They made quick work picking out sockeye, pinks and prehistoric-looking chum salmon. “Like an alligator!” Fox added. Whitney popped the gills to bleed out the sockeye and dropped them into a plastic tub filled with ice. As darkness fell, the crew headed into the beach to drop off their catch with Copper River Seafoods. They all looked up at their brailer bags full of salmon trying to guess how much it weighs. It was more than they expected – 343 pounds of sockeye dropped into icy totes to head across the road for processing. An unprecedented number of fish has been passing through the Togiak processor this summer. On its best week, Copper River clocked 430,000 pounds of sockeye through its doors, setting a new plant record. The run came in several days late for Bristol Bay’s east side, and the same thing has happened in Togiak. 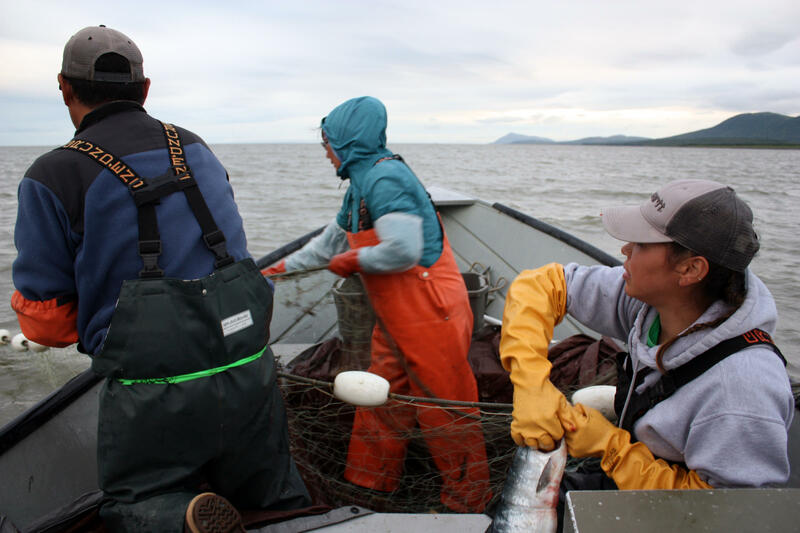 But unlike other fisheries in Bristol Bay this summer, the 30 or so drift net boats that typically fish Togiak didn’t have to worry about the hundreds of fishermen in the Nushagak descending on them when the fishing got good. Fishermen who’ve cast nets in other districts can’t transfer to Togiak until after July 27. Tim Sands, area management biologist with the Alaska Department of Fish and Game, said this helps preserve the “artisanal” nature of Togiak’s fishery. Fish and Game regulations allow commercial fishing in Togiak from Monday morning to Friday morning. With sockeye well past this year’s escapement goals, though, Sands extended fishing an extra 48 hours for three weekends straight since mid-July. Copper River plant manager Michael Gilbert was ecstatic. “It’s made a difference for everybody here. Nobody wants to see a closer on a Friday when they know the bay is boiling with fish. If they’re catching them, we’re taking them,” Gilbert said. Even though Togiak’s run is the smallest in Bristol Bay, it still provides a good amount of income for local fishermen. More and more people are beginning to commercial set net with help from a permit loan program from the Bristol Bay Economic Development Corporation, Carlos and Fox said. Carlos hopes other young people will take advantage of this resource to become more self-sufficient. The run is still going strong in Togiak, which is exciting. The cash from commercial fishing may be nice, but Carlos said fishing is about more than the money. She loves the subsistence elements as well. “We make dried salmon, canned salmon, salmon jerky. Plus getting to be with my family, and it’s better than hitting the gym every day,” Carlos said. And Carlos getting plenty of family time this summer. As midnight approached, she and Fox weren’t heading home to get some rest. They jumped out of their skiff to prepare for a baby shower they were throwing the next day. Life doesn’t stop just because the fish are finally in.